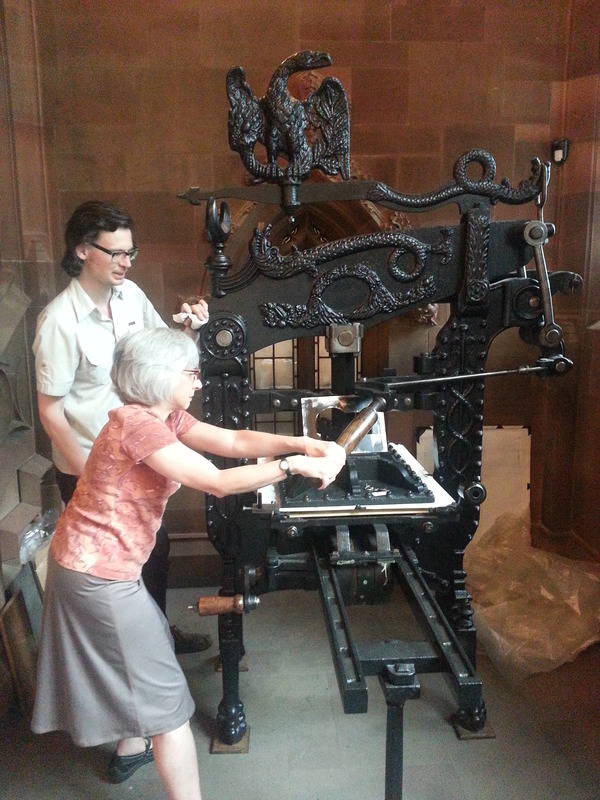 Last week, while at the massive International Congress of the History of Science, Technology and Medicine (ICHSTM) in Manchester, England (more on that in another post), I visited the John Rylands Library. It’s a wonderful late-Victorian neo-gothic building that opened on 1 January 1900 as a private library endowed by the widow of John Rylands, a Manchester industrialist who was one of the first millionaires of the industrial era. It now houses the Special Collections of the University of Manchester Library. 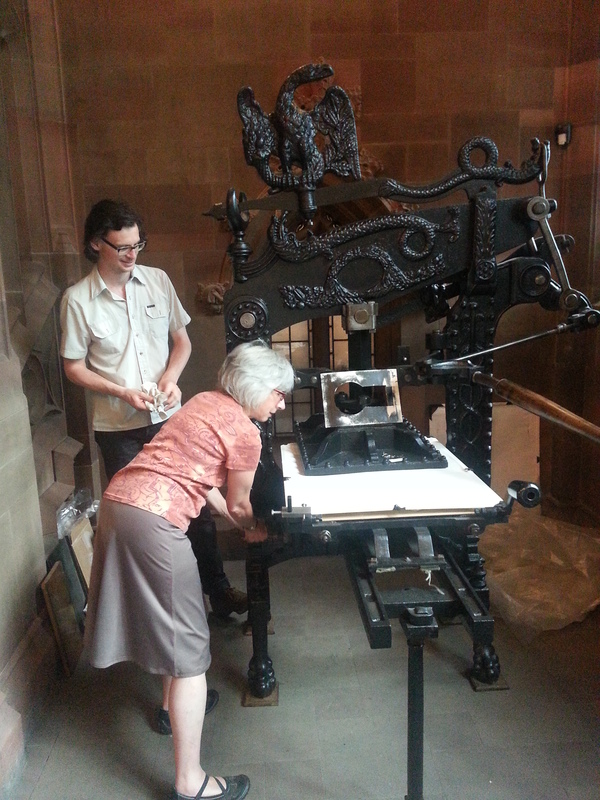 On the day I was there, demonstrations were being given of a nineteenth-century manual printing press, a beautiful ornate cast-iron machine. 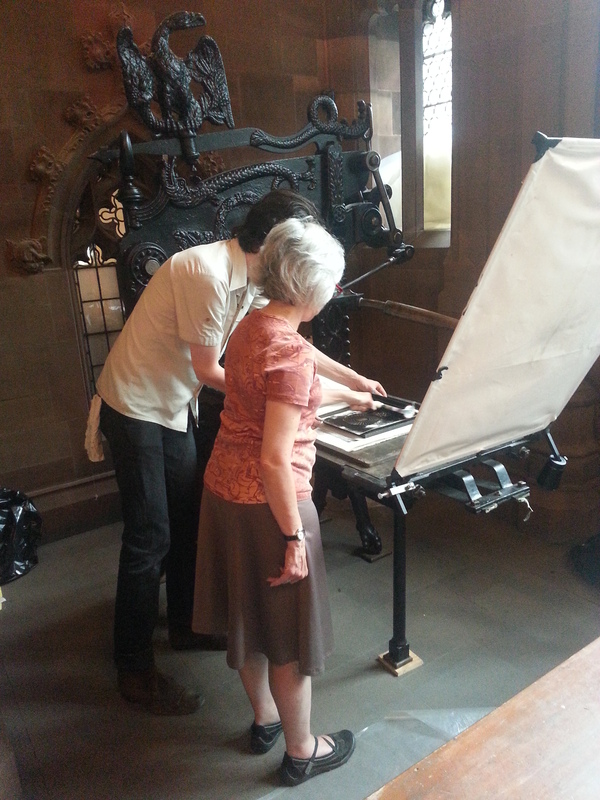 Urged on by my friend Roberta Ballestriero (who took the pictures below), I tried my hand at operating the press. Although I’ve written some about printing and especially engraving, I’d never actually done any myself. 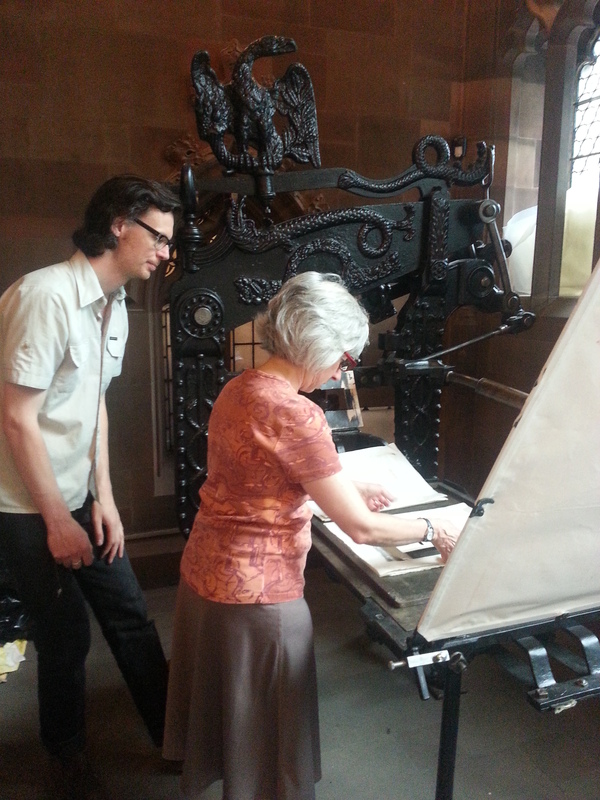 I was immediately struck by how physical the process of letterpress printing was. It’s a lot of work. 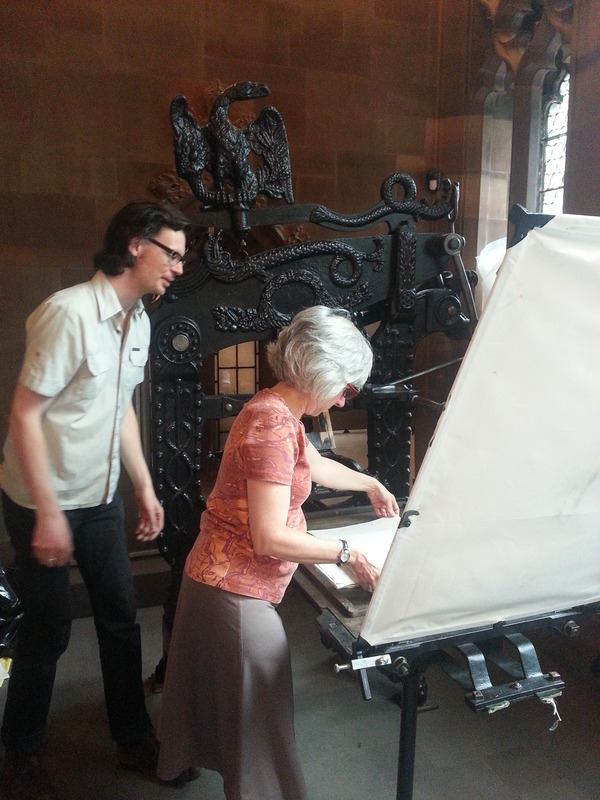 After inking the letters – or in this case, a metal plate with raised images – I carefully laid a piece of paper over it. Then a padded layer was added, and then a large flat frame covered in what looked like parchment was swung down to secure the whole. Turning a crank, I rolled this bed under the platen, and then pulled a handle to turn down the screw that applied the pressure to make the print. More turning of the crank rolled the bed out, I raised the frame and removed the padding to reveal the paper which I carefully peeled off. I had made a letterpress engraving. The whole process probably took a minute, maybe two. 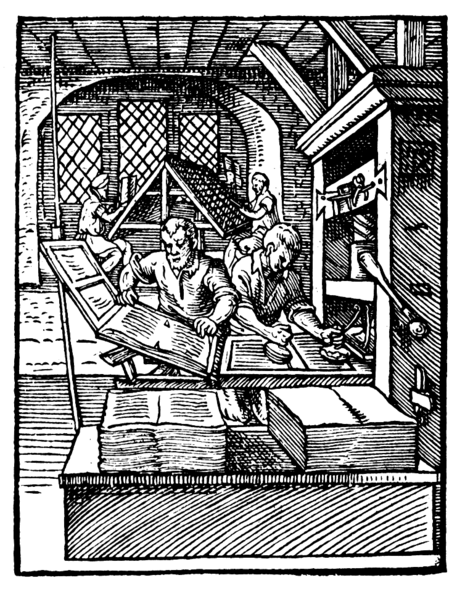 Printing a book with such a method, even taking into account the time spent in setting the type, would have been much faster than copying it by hand. 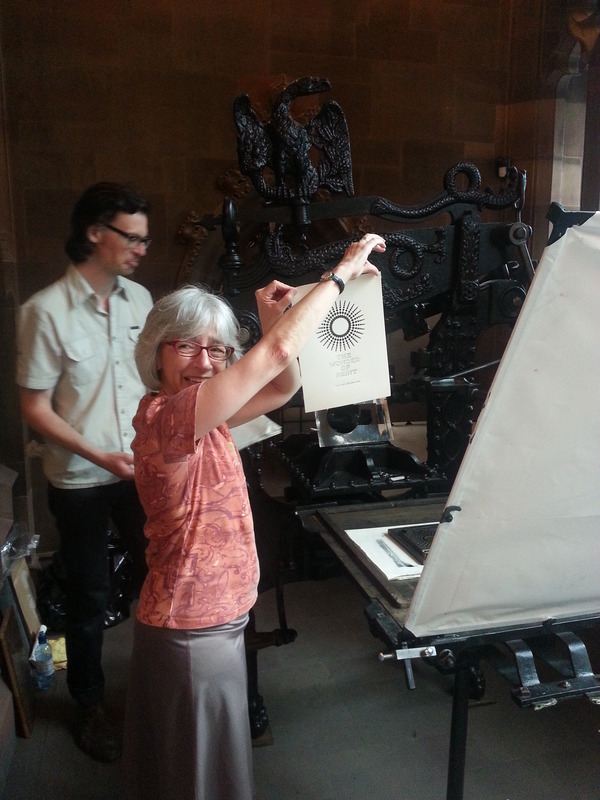 I was pretty slow, but skilled printers, particularly working in tandem, could produce thousands of pages in a day. It must have been exhausting, but exciting, work. Millions of books were printed in this way between the invention of the printing press in the 1450s and the advent of automation in the printing industry in the nineteenth century. I will never be able to look at a pre-1800 book again without thinking of the physical labor the printers and their apprentices put into each page.